Yu-Gi-Oh! 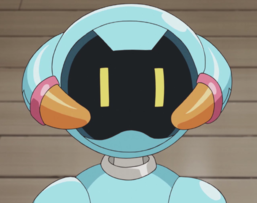 VRAINS episode 3: "Contact"
Roboppi (ロボッピ Roboppi) is a character appearing in the Yu-Gi-Oh! VRAINS anime. She works as a maid at Yusaku's house. Roboppi was first seen cleaning Yusaku's bedroom. Ai called her an idiot; Roboppi replied that "idiot" was a forbidden word. Ai asked Roboppi if she wanted to be smarter. ↑ 2.0 2.1 Yu-Gi-Oh! VRAINS episode 3: "Contact"
This page was last edited on 2 December 2018, at 22:09.